Find a charity to gift your knits. Make and give with us! This week has felt hard. No matter what your politics, it's easy to see how people around us are suffering, scared, and feel shaken lately. For many of us (Heather and I included), there is a feeling of dread at what is to come in the next few months and years. And with this dread, a feeling of urgency. Lucky for us (and you! ), we are knitters. We may not be the ones making policy, but we are the ones with two sticks and some string, and we can make a tangible difference! Life has been hard these last fewmonths (the last year, really) for me, personally. Our little family has been going through a lot, and so I've hunkered down, pulled people close, and stepped back from so much ... this space included. But now. Now I look at my son. At my daughter, with early intervention needs. At our potential loss of healthcare benefits (pre-existing conditions make that sort of thing scary). At all that the coming winter brings. And even though what I see for us is scary, I know that what others are facing is so much worse. The weather in Nebraska has turned. It is cold, and there are people sleeping on the streets. People around the world are fleeing their homes, finding temporary shelter (maybe ...) in refugee camps. Afraid for their lives, their safety, their children. Thousands live on reservations in America, with substandard conditions. Babies are being born in hospitals around the globe into families with next to nothing. Parents are snuggling preemies in hospitals, scared out of their wits, unsure of what to do now. The list goes on. A friend's son is going through chemo. A student's parents both just lost their jobs. There is a huge influx of homeless vets coming into our local VA outreach center. It is overwhelming. It is breathtaking. And yet. We have some sticks, and we have some string. We can perform small miracles with these simple items, friends. We can weave love and hope and warmth together, and remind people that the world still has some good in it. We can be the light-bearers, the peace-bringers, the amplifiers of joy and strength in times of struggle and despair. We Make. We Give. And We Repeat. Both Heather and I are social butterflies, at least here online! Not only are we excited to have MGR function as a space for you to find all the best charity-friendly patterns, along with charities in need RIGHT NOW, we're also branching out to social media platforms with the hope that you'll engage with us - share your favorite charities and patterns, follow us, comment, and so much more! Here's a comprehensive list of where we are, social media speaking! We've been quickly growing a pretty devoted Facebook following over the last few weeks, and couldn't be happier! When you click the "like" button, you'll receive blog updates, Insta-updates, as well as be able to share your favorite charities and patterns with us and the rest of the group. As we grow, the hope is to have some Facebook-only giveaways and features, so if you're on Facebook at least a few times a week, you'll want to visit our page! It's an understatement to say I'm obsessed with Pinterest. I find myself hopping onto the phone app at least a few times a day to see what people are sharing, and to share some new pins to our MGR boards - it's too easy not to! Pinterest is perfect for MGR, helping us curate boards full of patterns and charities for like-minded crafters to find just the right thing exactly when they need it! Visit the MAKE | GIVE | REPEAT Pinterest page, click follow, and get in on the goodness! We recently started a Ravelry group, and plan to share our monthly charity focuses there, as well as chat with other charity crafters in a more one-on-one way. I love the way groups quickly take on a life of their own over on Ravelry, and I can't wait to see how our group's personality develops! Join here! I love that Instagram is a purely visual social media platform. While you can share words, the main focus is always on the photos. We're using our MGR Instagram account to showcase all of the amazing projects you all are making!! Every time you tag a project #makegiverepeat, we'll see it pop up in our feed, and the plan is to feature as many of these projects as we can!! So whether you're crafting for our charity of the month or the charity you give to regularly, we'd love to see what you're making! While we're still growing our Twitter feed, the plan is for this space to not only feature what we're talking about here, but what other knitters and crocheters are doing as well! Twitter is a great way to stay quickly connected, and as we continue to post in this space, look for fun updates from the MGR community as well as shares from other Twitter feeds we love! Finally, we are also on Bloglovin'!! I love using Bloglovin' to follow all my favorite blogs because it shows them to me on their actual web pages, so I can see the sidebar, formatting, and everything else. If you're a Bloglovin' person like me, you can add us to your daily reads! Once a month we send out an update to our newsletter subscribers - this is the perfect way to keep up to date on our charity of the month, suggested patterns and yarn. Find new charities you want to support and learn how to donate your knits! 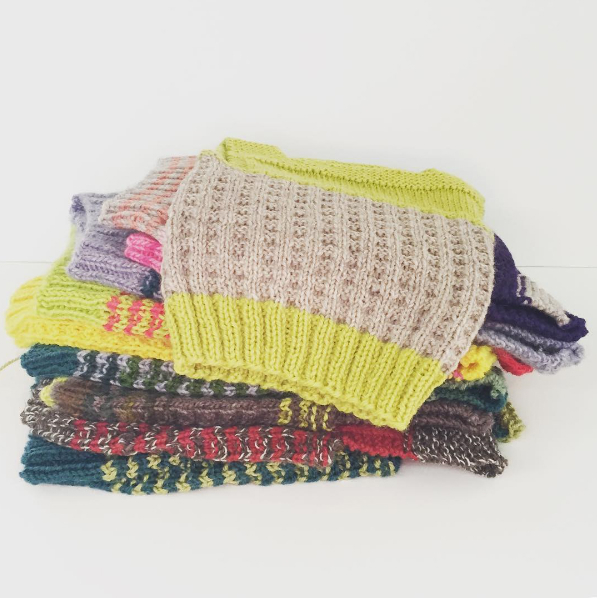 MAKE | GIVE | REPEAT is a collaboration between She Makes Hats and Ewe Ewe Yarns.